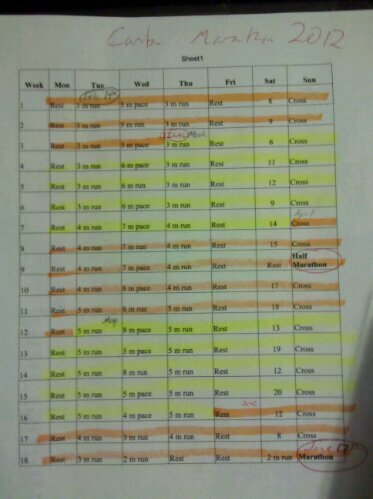 I feel much better after this week’s four-day running schedule than I did after finishing up Week One. I think actually managing the three consecutive mid-week days went a long way toward re-establishing my training rhythm, I know I was glad to have just one treadmill session, and I think I’m starting to feel the familiar benefit of just putting in the miles. Tuesday, Feb. 21 – Schedule: 3 miles. Actual: 30 minutes (approx.) on the treadmill. Wednesday, Feb 22 – Schedule: 5 miles. Actual: 5 miles. Time: 45:40. Pace: 9:08/mi. Thursday, Feb. 23 – Schedule: 3 miles. Actual: 3.14 miles. Time: 26:52. Pace: 8:33/mi. Saturday, Feb. 25 – Schedule: 9 miles. Actual: 9 miles. Time: 1:23:36. Pace: 9:17/mi. Tuesday’s treadmill run was about as much fun as expected – in other words, not much – although it was nice to have the Retroist podcast about Revenge of the Nerds to keep me distracted while I ran in place and tried not to hear every little creak and groan of the machine. Because Kelsey had her tonsils taken out that day and we had had to be at the hospital at 5:30 a.m., I didn’t run until late afternoon – late enough that my next run was less than 12 hours off. Wednesday morning, shortly after 5 a.m. my brother Adam and I went out for the same 5-miler as a week before, though this was just a “normal” run, and we weren’t supposed to be running for pace. We ran it about 6 seconds per mile slower than last week, but I felt better about this Wednesday’s run than the last one, because my recovery was much quicker, and I felt like I still had gas in the tank at the end. We’ll see how next week goes, when we’re supposed to be aiming for pace time again. I worked from home on Thursday so I could keep an eye on Kelsey, and I went for an outdoors afternoon 3.14 miler (henceforth known as the Pi-Mile loop, as noted by my friend Kato). I really enjoyed this one: My first third-consecutive-day run in a looooong time, and I managed a much more acceptable pace. Saturday morning was cloudy with flurries and just below freezing when Adam and I went out. We ran into a bit of a headwind on the outbound portion of our loop, and encountered some slushy spots, but it wound up being a much better run than I anticipated: a mile longer than last week, and yet we did it with an average time of 9:17, which is more than a half-minute faster per mile than I managed on Week One’s 8 mile. Canton Marathon is 16 weeks from tomorrow. As of 6:30 this morning, that Feb. 14 square is marked with an X, since my first official training run for the 2012 Canton Marathon is in the books. It was not enjoyable. The schedule only calls for three miles, but I wound up doing them on the treadmill. And since I don’t trust the treadmill’s distance gauge, I figured I’d be safe going for 31 minutes. It didn’t help that I haven’t run in awhile. Tomorrow calls for a five mile pace run. My brother Adam and I are shooting to beat his first marathon time of 3:40, so we’ll be going for an 8:23 pace.